At the YMCA we try and do Lent a bit differently. So what’s it all about? Lent is a season in the Church calendar that helps Christians prepare for Easter and Holy Week. It’s often associated with giving things up and during the season many people try and go without everyday conveniences, luxuries or creature comforts. At the YMCA, we try and do Lent with a bit of a twist. Over the last 3 years, we’ve gone through the season in a different spirit, trying each day to live life generously. 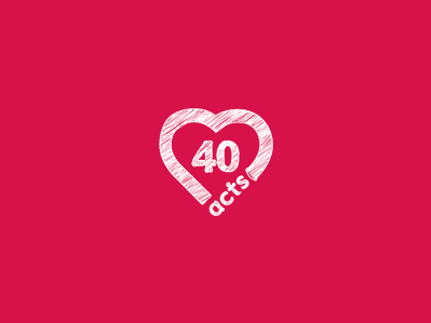 Inspired by Stewardship’s ‘40 Acts’ resource we’ve sought to challenge each other to think about others, offer a helping hand, sacrifice and give generously to those in need. As you can imagine, many of the people who choose to make the YMCA their home arrive with very little, so generosity can be very low on their lists of priorities. Yet each year we’ve been astounded at the way our service users and staff have responded to this challenge. We’ve seen people reconnect with long lost friends, become conscious of the impact they are having on the environment and even take steps to forgive people that have hurt them in the past. So whether it’s making a difference in your community, being aware of your environmental impact in your daily choices or baking cakes for your colleagues, we hope any pray you will be inspired to live life through lent generously.